Farley, Andrew. The Naked Gospel. Grand Rapids: Zondervan, 2009. As I mentioned in a previous post, I’m taking a training class for lay counselors through my church. As part of the class we were required to read three books and submit book reports on each one. (You can read the first book report here.) 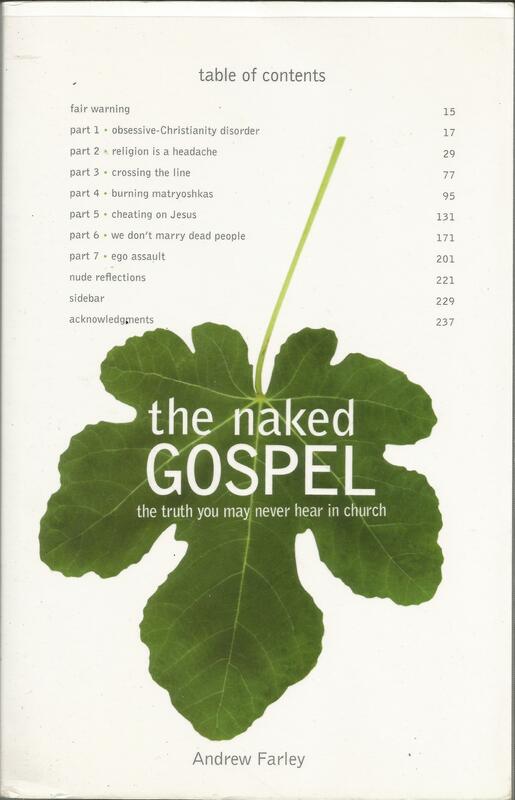 The second book we read had the intriguing title The Naked Gospel, by a pastor named Andrew Farley. It’s a present-day explanation of what is often called “The Exchanged Life” view of the Christian life. I had not heard of Farley before, so I was interested to see what he had to say. Here is my summary and response to the book. Farley begins by telling his own story, saying he started out his Christian life by, one might say, “busting his tail for Jesus.” He says he burned out trying to do this and eventually realized he simply couldn’t live the Christian life by his own strength. He talks about how he had to unlearn a lot of his misconceptions about Christianity in order to learn what the Bible really teaches. Farley then explains carefully and systematically how Christians are no longer under the Old Testament law or good works as a means to secure God’s favor. He points out what both the apostles Paul and James taught, that if you try to keep the Law, you’re responsible for keeping the whole thing, and if you fail to keep even one part of it, you’ve broken the Law (see Galatians 3:10 and 5:3 and James 2:10). Since no one can keep the Law perfectly then we are incapable of keeping it at all, which is why God provided salvation by a different means—by grace through faith in Jesus Christ. Farley says this is also the means by which we are to live the daily Christian life as well – by grace through faith in Christ. Farley even extends this to the Ten Commandments. He points out that Paul says “the letter kills” (2 Corinthians 3:6, meaning the letter of the law) and calls the law a “ministry of death” (2 Corinthians 3:7). Farley says this is no less true for the Ten Commandments; even trying to live by the Ten Commandments will bring death to us rather than life, because the Law incites sin (see Paul’s discussion of how the Law evokes sin in Romans 7:5-13 and also Romans 3:20 and 1 Corinthians 15:56). Grace is the only means to be free from sin. Farley goes on to demonstrate in various ways how the New Covenant (Testament) sets us free from the Law. He gives the example discussed in Hebrews 5-7 that the priesthood of Jesus is of the order of Melchizedek, while the Law prescribes a priesthood descended from Levi and Aaron. Moreover, Jesus is from the tribe of Judah, not Levi, so His priesthood does not conform to the Law. Farley offers more examples of how the Law has been superseded in the New Testament. He sees both the tithe and the Sabbath as Old Testament concepts no longer in force under the New Covenant. The author shows that the Old Testament Sabbath was a picture or precursor of the true Sabbath rest of God spoken about in Hebrews 3-4, in which we are able to rest from our striving for good works because of the once-for-all sacrifice of Christ on our behalf. Farley talks about how in the New Covenant, instead of trying to keep the Law, we rely on the Holy Spirit, who produces fruit in us that leads to a way of life that satisfies the requirements of the Old Testament law. He shows that through faith in Christ, believers are made truly and actually righteous before God, not just positionally righteous. He talks about how we were born in Adam, but through salvation we are taken out of Adam and placed in Christ. Farley makes much of our identification with Christ. This is the key by which we actually live the Christian life – by Christ living through us. Farley spends a good bit of time trying to show that the forgiveness we have through Christ is once-for-all, that when we are saved, all our sins–past, present, and future—are forgiven for all time. Therefore we don’t have to ask for forgiveness every time we sin because we already have forgiveness once and for all. He even goes to pains to show that 1 John 1:9, which says “If we confess our sins God is faithful…to forgive us…” is for unbelievers, not believers. This was the part of the book I found least convincing. To begin with I question his exegesis of 1 John 1, though he did help me to see certain aspects of it in a different light. But also there are other passages of Scripture which imply that walking in blatant unrepentant sin hinders our relationship with God, or at least our experience of that relationship. (1 Corinthians 5 comes to mind as an example, in which Paul deals with a case of gross sexual immorality in the Corinthian church.) Even for the Christian, ongoing repentance seems vital for walking in an intimate experience of relationship with God. Farley claims people are suspicious of grace because they fear an emphasis on grace will give people a license to sin. Therefore Farley emphasizes over and over again that grace does not lead us to sin more, but is actually the only true means to overcome sin. We think the Law will deter us from sinning, but actually Scripture says the Law provokes us to sin (see Romans 7:5-13 as mentioned above). It’s grace then, not law, that helps us master sin. This overcoming of sin is entirely dependent on Christ living in us and through us. There is much more I could say about The Naked Gospel. While there are some parts of it I question, overall I found it to be a very helpful and very Scriptural explanation of the life that is lived by grace through faith in the indwelling Christ. This entry was posted in book review, Christian, Christianity, Exchanged Life, faith, freedom, grace and tagged Andrew Farley, Exchanged Life, Galatians, grace, Romans 7, sanctification, The Naked Gospel on June 17, 2015 by musicman707.